The iOS Messages app defaults to sending what is called a “read receipt” when an iMessage is opened and read within the application. That Read Receipt feature can be helpful for some conversations but it’s not always desired for every message, and though disabling Read Receipts for Messages in iOS is certainly one option that many iPhone users choose, another trick is available to those with 3D Touch equipped iPhone screens, thanks to the ‘peek’ and ‘pop’ features of such devices. 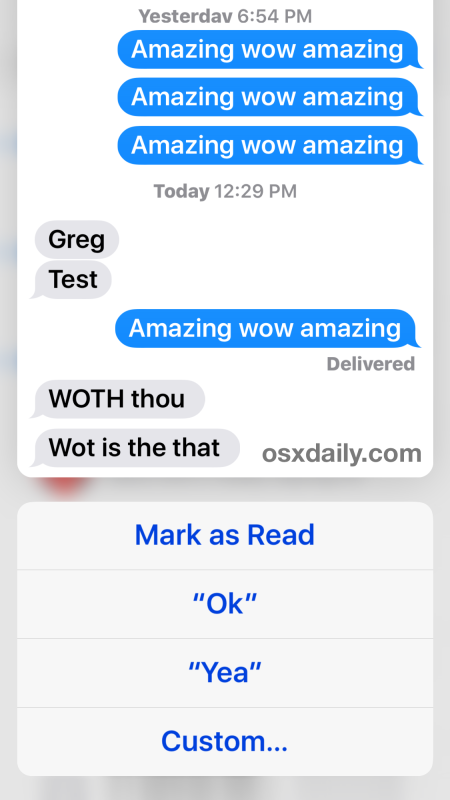 Here is exactly how you can read an iMessage on iPhone without sending a Read Receipt to the sender – and without turning the feature off entirely. Like some other 3D Touch tricks, it may be helpful for some users to adjust the 3D Touch pressure sensitivity settings to get the most out of this. Nice trick, isn’t it? You’ll obviously need a device with a 3D Touch display for this to work, like an iPhone 6s or iPhone 6s Plus, as the standard screens do not offer peek and pop or touch-pressure detection. This is really helpful if you wish to leave the read receipts feature enabled, which can be great for close friends and family, but is often less than desirable to keep enabled for some other contacts. Since there is currently no method of selectively enabling or disabling the sending of those read receipts to individual contacts, this 3D Touch approach offers an alternative to iPhone users who want to read a message without actually sending the “Read Receipt” to the sender, and also without turning off the feature entirely which results in the “Delivered” message sent to senders instead. Basically this means you can keep the feature on but maintain a bit of privacy for reading messages in situations that call for it. Thanks to MacTrast for discovering the handy trick. Good tip. You can also see the messages in notification center if you have texts turned on. “Mark as Read” doesn’t appear anymore. Instead ‘OK’ appears on top. Got the latest version of iOS installed. “Mark as Read” doesn’t appear because the message is already read. Try again with an unread message. The whole point of this is so that you can 3D Touch peek and read a message without marking it as read and without sending the read receipt to the iMessage sender. Very well explained friend, appreciable effort by you, thanks for giving this pictorial way of explanation.